Keeping Chickens are becoming increasingly popular as pets, even in urban and suburban areas. Many people get chickens as a source of eggs, and then realize they are fun pets with great personalities. There are many breeds, each with their own feathering characteristics and personality traits. 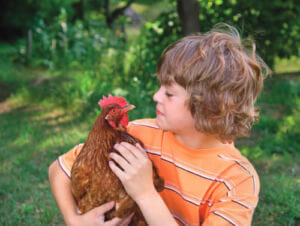 Common breeds include Rhode Island reds, Orpingtons, Silkies, Barred Rocks, and Polish chickens. Chickens need to be housed in predator-proof coops that include nest boxes, perches, ramps, and access to a safe outdoor area. A general rule of thumb is a single chicken requires a minimum of 3.5 square feet of space. Nutrition is an important component of chicken care. Starter diets are fed to chicks under 6 weeks of age, grower diets are fed until 14 weeks of age, and layer diets are fed through adulthood. Chickens can also be given fresh greens, crushed oyster shell, and some table foods. While they love to forage in the yard, the bulk of their diet should consist of a commercial diet. Although chickens generally only live a few years, there are plenty of reasons to bring them to the vet! There are many types of parasites that affect them, including lice, mites, and gastrointestinal parasites, and several bacterial diseases including Salmonella. Some of these diseases are transmissible to people, which is important in homes with young children or immunocompromised owners. There are many nutritional and toxic disorders that are much easier to prevent than treat. Chickens often present for wounds from predators, sore feet, or skin issues from hen pecking. There are also a significant number of hens who have problems with egg laying. Most of these require medical or surgical intervention (yes, we do surgery on chickens!). Finally, there are many viruses that are reportable, including avian influenza, because they have significant ramifications for public health. Having said that, there is a lot we can do to help chickens live happier and healthier lives! Overall, chickens make wonderful pets. We love seeing them as patients, in sickness and in health! Please contact The Family Pet Hospital in Ashland if you have any questions.